'Alexander's Ragtime Band' Susan Stamberg reports on the story behind Irving Berlin's hit "Alexander's Ragtime Band." 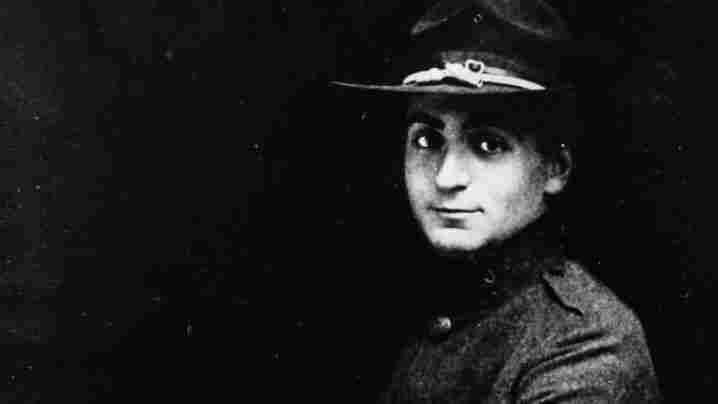 Composer Irving Berlin, circa 1918. Irving Berlin's "Alexander's Ragtime Band" has been so widely played for so long that it's hard to imagine how fresh it sounded early in the century. As Susan Stamberg reports, it was the revolutionary tune that launched the phenomenon known as American popular song. Variety magazine called "Alexander's Ragtime Band," written by Irving Berlin at the age of 23, "the musical sensation of the decade." Another source, preserved in Berlin's own scrapbook, declared it a "public menace." While Berlin's daughter, Mary Ellin, calls it "The theme song of a generation." But, Berlin's biographer Lawrence Bergreen adds, the song was passe by the time it was written. "In fact, the ragtime craze had already swept the country several years earlier and had played itself out." In those days before radio or TV, families and friends gathered around the piano and sang. The music was printed on sheets of paper that sold for five or ten cents. Stores like Woolworth's kept 1,000 different song titles in stock and a truly popular song, like "Alexander's Ragtime Band," made cash registers sing. A true phenomenon, it sold a million and a half copies of sheet music in its first year and a half. It was so popular that it was played on the Titanic. "Keep in mind that [Berlin] was writing, at this point in his life — and he was very young — about four or five songs a day," Bergreen says. "Or, I should say four songs a night or five songs a night, because even then he was an insomniac, and so he would stay up all night writing songs until he said, you know, drops of sweat were pouring from his forehead and plopping onto the paper in front of him." Well, that's a bit of perspiration in this representation, Bergreen admits, because Irving Berlin, probably the greatest all-around songwriter this country has ever had, couldn't read or write music. With no formal training, Berlin always hired a musical secretary to set his melodies down on the paper he sweated on. "Because of his propensity to use musical secretaries, he was dogged by rumors his entire life that he hired ghostwriters and they wrote tunes for him anonymously," Bergreen says. "Not true. You know, there's just no substance to those rumors, which were a good story and kind of promoted by his many jealous Tin Pan Alley rivals." Berlin wrote the song first as an instrumental, and when the tune alone didn't do much, he went back and wrote lyrics. The song got into a Broadway revue and began catching on outside New York, thanks to hardworking song pluggers. Then, back in New York, Al Jolson, America's first superstar, sang it and the song went to hit heaven. Bessie Smith, the great blues singer, recorded "Alexander's Ragtime Band" in 1927. Her interpretation is earnest and sincere, a Smithsonian liner note says, as if there actually were an Alexander's Ragtime Band, and she were one of its true components. Irving Berlin, who became immediately known as the ragtime king, didn't set out to help invent American popular music. All he wanted to do was write hits. Even though biographer Lawrence Begreen says Berlin could have rested on his ragtime. "I think if he had never written another song after 1911, he would have always been remembered as that young composer who wrote the unforgettable, all-American 'Alexander's Ragtime Band.'" Happily for the world, Irving Berlin wrote thousands of songs after "Alexander." By the time he died in 1989 at the age of 101, Irving Berlin had produced most of America's popular anthems.